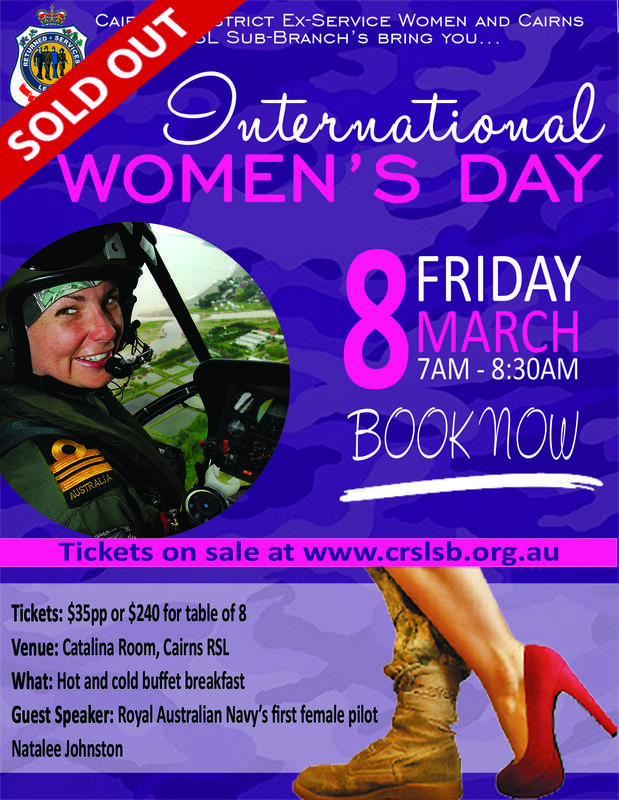 The Cairns RSL Sub Branch in partnership with the Cairns and District’s Ex-Service Women’s Sub Branch will be hosting our annual International Women’s Day breakfast to celebrate the wonderful contributions women have made to the community. There is no doubt that key note speaker Natalee Johnston will move and inspire guest with tales of her career in the Royal Australian Navy (RAN). Natalee joined the Royal Australian Navy in January 1994 and within four years had gone on to complete her Bachelor of Science majoring in Physics, gained her pilots wings and become the RAN’s first female pilot. Guest will be given the opportunity for Q&A session and to meet Natalee. The breakfast will also include a hot/cold buffet style breakfast and an extensive range of raffle prizes to win thanks to the following local businesses – Regan O’Neill Art, Piccone’s Supa IGA, Elysium Apartments, Our Happy Life, Louie’s Liquor Barn, Cairns ZOOM and Wildlife Doom, Kuranda Scenic Railway, Reef Hotel Casino, Cazaly’s Cairns, Tjapukai and Brothers League Club. This is sure to be a sold out event not to be missed! Tickets can be purchased online at our shop or by phoning 4051 5254.